Back for a second time. 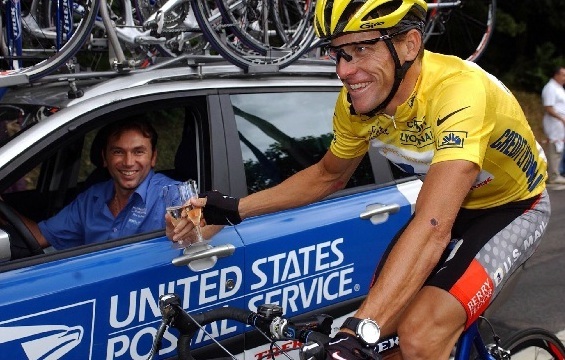 That’s way of Lance Armstrong to appreciate his life. “You certainly do not need to go through suffering like me to appreciate your life,” said Armstrong. Second life. that he feel after through the cancer pain. Escaped death, or perhaps already dead. Young men, age 25, suffering from choriocarcinoma. Two surgeries and four periods of painful chemotherapy lived. The long period of struggle. When it passed, and found himself not so dead, the question arises: What’s a life worth? Lance Armstrong answered by the tour. Bike racing his favorite sport since childhood, and the Tour de France is the most challenging race. Lance Edward Armstrong (born Lance Edward Gunderson on September 18, 1971) is an American former professional road racing cyclist who won the Tour de France a record seven consecutive times, after having survived testicular cancer. He is also the founder and chairman of the Lance Armstrong Foundation for cancer research and support. Every time won the tour, Lance felt alive again. After going through the struggle and suffering very heavy almost makes surrender. But for him, the suffering lasts a while, while giving up lasts forever. In the process of healing, he speaks to some cancer patients who are undergoing chemotherapy. And that was the beginning of his involvement to cancer. Next, he later founded the Lance Armstrong Foundation in 1996. The foundation supports research, awareness and early detection of cancer. Some day, Lance Armstrong was asked by press: Which is more important, winning the tour or beat the cancer. Lance replied: beat the cancer is more meaningful to me.